Week 18: Well, it has come to this… I have joined a gym! This has been another big week in my health journey. The big event this week is that I joined a gym. There was a morning where I went out for a walk/run and the temperature was in the 40s so I decided it was time to start moving to an indoor option. There is a great gym close-by with all sorts of TechnoGym gadgets tied to apps and it isn’t overly crowded (intentionally) and it is cheap. So I pulled the trigger and did my first few workouts there. Still prefer to go outdoors when I can, but I will blend for a bit until it is consistently too cold. First time at the gym was a mixed success. After finally getting all of the gadgetry to sync up (still struggling with how to make the Fitbit work in the gym), I did a good workout on the treadmill with some walking and running. However, the treadmill is way different than being outside and it took me a bit to get my footing and feel comfortable, but I got there. Then, I was done with the treadmill and I got off and headed to the side of the gym with weights and really had no plan. I didn’t know what to do and just meandered around using a machine here and there. So, my lesson is that I really need to figure out a plan and routine to get myself into. One thing is good, the treadmill keeps a consistent speed so I am not slowing down without knowing I am and the result was my highest calorie burn in a single workout to-date – over 500 calories in 30 minutes of treadmill time! I am happily firmly into the 260s with my weight this week. Though there have been some big day-to-day fluctuations in that. I have definitely confirmed that high alcohol consumption, regardless of calorie impact, turns into weight fluctuations. So, at least I have an explanation now. Another tough setback this week is in the stress department. With the changes that have happened at work, some budget challenges and people behaving badly, the stress is really starting to increase. I am still doing a pretty good job with sticking to my boundaries of not coming in early and not working too much at home, but the environment is certainly not ideal now. This is just one month out from my return visit to the doctor to evaluate blood pressure and doesn’t bode well for that. Finally, this week, I had an interesting experience. On Saturday morning, I got up and went for an outdoors workout with a walk/run around Schiller Park. Then, when I thought I was done, I decided to go to a coffee shop just off the park (Winan’s) and grab a cup of coffee. While I was there, I learned that there was an event featuring a walk from the German Village location of Winan’s to the downtown Columbus location (about 2 miles) that happened about an hour before. I was a little disappointed that I didn’t know about it because I thought that sounded like fun. Then, it dawned on me: I don’t need the formal event for me to do that walk. So, I set out to do a combo walk/run from German Village to downtown. When I got to the downtown location, which is really nice, I discovered that my favorite barista from German Village was working there that day. So I went in and got another small coffee and watched the world go by. Then, I set off to run a lap around the Columbus Commons park and did a walk/run home. In all, for the day, I walked more than 20,000 steps and more than 10 miles! Definitely not something I would have ever made the decision to do before. Well, my progress didn’t exactly go as planned this week. As I mentioned last week, I had planned this week to be down into the 260s. That would be a good range to be in and I would finally be getting into a non-embarrassing weight class. Well, that didn’t exactly materialize this week. At one point this week, I was 5 pounds heavier than my best day last week. It ended up taking all week to get back down to the 270 mark that I had achieved last week. I am not completely sure what drove the increase in my weight. I did have a couple of moderately high calorie days, but they were still completely within my daily target. Friday was a little tough because I had a donut, pizza, steak, beer and wine all in the same day and was 600 calories over my net target. There were a couple of days of multiple drinks too. But, none of those were days before the big gain, they were after as my weight was coming back down. I know that fluctuations are going to happen daily, but it would be easier not to get discouraged if I was able to correlate them to some root cause. Separate from what the numbers are telling me, I experienced some success this week in other ways. This was the first week when I saw a distinct uptick in the amount of random people giving me positive feedback. Multiple times at work and beyond, somebody would take me aside and tell me that I am looking good or that they really see the impact. This kind of culminated with the owner of a bar that we frequent at Indian Lake bragging about my progress to other bar customers. The other customers were people I didn’t even know. He was telling them how proud he was of me and my accomplishments. I guess the biggest lesson I learned this week is that the numbers are just part of the story. My journey has lots of ways to evaluate success and the scale is just one indicator of progress. 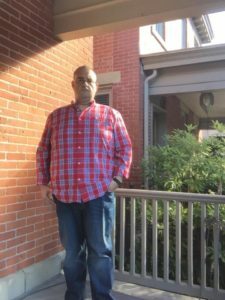 Last week was spent celebrating my 50-pound milestone, that is over now. This week was about moving on to my new goal. I want to get to the 75 pound mark before the end of the year, by Christmas would be amazing. I am totally convinced I can do this! This week, I had my first experience of having a day when my workout(s) burnt more than 1000 total calories. I did some running, some walking, some vigorous house cleaning, some more walking and really just hit exercise hard and got to 1372 calories in one day. So, that’s a big win for me. Also, this week, I had my best run yet. Not only can I run fully around one side of Schiller Park, I got about a third of the way around the second leg without stopping. Then I walked the remaining two-thirds of that side before starting to run the third side. In all, for my combined walk/run, my mile time was under 12 minutes which is what some people do just with running. So, I am making progress of building my endurance. However, I continue to learn about my body and the day-to-day weight fluctuations that can happen. For example, from Sunday to Monday of this week, I gained 2 pounds and went back under 50 pounds lost. But, then I lost 4 pounds from Monday to Tuesday. It appears that alcohol may be the culprit on some of my day-to-day weight swings. From further research, it looks like alcohol causes my body to retain water for a day, but taking a day off drinking (at least anything significant) helps instantly drain that. So, by the end of the week, I was almost out of the 270s completely on my weight and headed for the 260s. Our bodies are so complex! This was a big week and a proud week for me. This was the week where I finally cross the 50 pounds lost mark – I lost over 15% of my body weight and about 3 months. Plus, most importantly, I did it my way using my plan and enjoyed the process. I am so proud of myself for being able to do this and having this kind of success during a year where other successes were few and far between. I definitely would not have been successful without all of the support I have received. First off, my wife Liz has been amazing through this entire journey. She has been supportive and helpful. She has been understanding of me talking about it all the time. So has been very supportive of me saying that this is my top priority and not thinking that it means that she is any less important to me. She is a great partner and the past 90 days remind me of why she is such a great wife. Beyond the support of Liz, I have huge support amongst my friends. People like Julie, Beth, Patti and the list goes on, encourage me, they listen to me and they are genuinely interested in me. Plus, I posted my 50-pound milestone on Facebook because I use social media as an accountability tool and motivator (and because I tend to over-share my life on social media). I got 120 likes on my post including lots of supportive and encouraging comments. See, social media isn’t evil! As a reward for myself for hitting the 50-pound mark, I decided to take a PTO day off work just for myself and called it “Tony Day”. I spontaneously grabbed coffee with a former boss, I got my car washed, I got my hair cut, I had lunch with a friend and I went shopping. As you can imagine, 50 pounds lost has quite the impact on the fit of my clothes. More specifically, my clothes don’t fit and look ridiculous on me. On several occasions, my pants have almost fallen completely off of me despite my belt. Plus, some of my shirts really look like a second person can get inside them with me. As much as I know that I have a transitional body right now, I cannot delay replacing clothes any longer. For years now, me going to get new clothes meant that I was going to the same big & tall store. So, that was my go-to this week. I went in and tried on a lot of clothes. Pants were a success and I bought 3 pairs of jeans. I am down 4-6 inches on my waist and nearing the bottom end of the big & tall store’s sizes, but am not there yet. Shirts, on the other hand, were a bigger challenge. Even the smallest size big & tall shirts were too big on me. So, I walked out of there without shirts. Then, I went to Old Navy (where I had previously struck out) and found that their classic fit shirts (not slim fit) are perfect for me. So, I bought 3 new shirts too. So, overall, a productive day and a great reward for my work. Plus, I think it is great that I can finally say goodbye to the big & tall store. That is something I didn’t expect to be able to do in my life.